AN ENCHANTING OASIS in a beautiful Andalucian rural setting, yet only 45 minutes' drive from Malaga Airport. Ideally located for visiting the major historical cities of Sevilla, Granada and Cordoba, as each is only two hours' drive on excellent road networks. The marvellous town of Antequera is only a 30 minute drive away. Looking for something really different? Incredible oportunity! 13 Bed 11 Bath. Featured on British tv, Sunday Times, Vogue Magazine, Traveller, Geo etc. Presently used as a very successful holistic holiday centre, and includes lovely private home of over 250m2. Approx 700 m2 built and 5000 m2 plot. In one of the most beautiful little valleys in Andalucian nature reserve. Rustic villa in the Spanish countryside on an 850m2 plot. The villa has 4 bedrooms, a large living room with fireplace, a large dining area, beautiful gardens with a private pool, a large roof terrace and a private car port for 2 cars. The villa is based on old moorish architecture, it is a small oasis set only 5 minutes from Sotogrande amongst the orange groves. A stunning apartment in a Moorish castle. A unique home in Andalucia, just 15 minutes inland from Marbella and part of the Unesco Biosphere of the Sierra de las Nieves. Choose between all the facilities of a hotel, room service and even a la carte dining or be totally independent. Close To Golf Courses - Very Well Maintained Apart 2 Bdrs. Very nice apartment on the 1st floor, in a well maintained development near to golf courses, close to amenities, walking distance to restaurants and shops. Quiet residential area, mature communal garden with pool and security guard. The apartment comprises lounge with dining area, 2 bedrooms, 2 bathrooms, terrace, fully fitted kitchen, marble floors, sat-TV and alarm-system. Beautiful Rural Hotel & Restaurant Opportunity! Luxury 3 bedroomed Villa situated in prime residential area on coast with all amenities. Ideally situated between Malaga and Marbella with easy access to beaches and a wide choice of Golf courses. Villa lies within own grounds and has private swimming pool. Recently renovated to high standard with 2 bathrooms (1 en-suite) Sleeps 6 (1 Dble room and 2 twin rooms). The ultimate romantic Spanish hideaway, nestling amongst the olive groves, with views of ever changing mountains. 2 bedrooms, 1 big bathroom, 1 laundry room, fully furnished kitchen, living and dining room, the apartment is totaly have your own entrance and carport, no steps or elevator. with comm swimmingpool. Estate In Costa Del Sol. 89 Acres 1km From Coast. One of the last fincas/estate for sale available on the Costa del Sol in Estepona, at 800mts. from the beach and 800mts. from the center of the town of Estepona. 360,000 square meters approx. Main house, guest houses, pool, tennis, sauna, stables, other auxliary structures, etc... Great for construction project or anything else. An unexpected Eighteenth Century Palace just Seven Kilometers from Granada. Number one in the square at Viznar and joined to the village Parish Church. Its close proximity to the Church, perfect for its original occupant. Archbishop Don Juan Manuel Moscos y Peralta. Indeed his seal still adorns the locks of many doors in the main salons. Situated In A Calm Zone,close To The Park Nature "el Chorro"
Development under construction , 1 and 2 bedroomed luxury apartments with sea views. Beach at 300 meters . 47, yes 47 golf courses within easy drive . Puerto Banus and Marbella nearby as well as Sotogrande and June 2002, full guarantees . 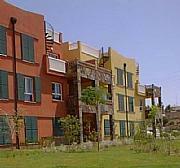 houses are in a private plot of over 1.000m2, with Sea views. 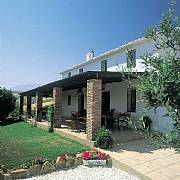 The Three properties include an adjoining Farmhouse, to partly reform(over130m2), a Modern Villa(over 110m2). A separate Villa to partly complete (Over 100m2).